This article explains about the Certification Mark of PUC for Motor Vehicles in India. Which vehicles must have PUC? All motor vehicles must have a valid PUC Certificate. What are the charges for PUC checking? PUC charges vary from place to place, but are usually between Rs. 60 to Rs. 100 for a 4 wheeler – Petrol LMV. What is the procedure for PUC tests? The accelerator should be fully pressed. The reading of pollution levels should be noted with the acceleration pedal fully pressed. The vehicle is kept idling without the accelerator pressed. Only one reading is taken. What is the validity of a PUC Certificate? What is the validity of PUC for a new car? When should the first PUC check be done on a new car? The validity of PUC for a new car is 1 year from the date of registration. Thereafter PUC tests must be done every 6 months. In the case of higher CO2 levels, refer to the table above. What is required to undergo a PUC check? What should be mentioned on the PUC Certificate? The PUC certificate must mention, the certificate serial number, the vehicle license plate number, the date of testing, the expiry date, the emission readings. Who is authorised to conduct a PUC test? 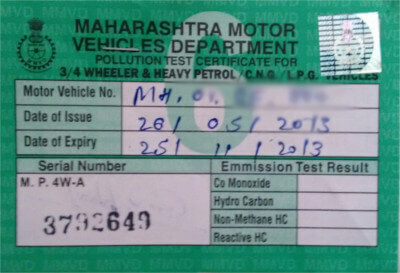 The persons conducting the test should hold a minimum qualification of certificate in Automobile Engineering or Motor Mechanics issued by Industrial Training Institute of Government of Maharashtra and should also know the procedure for minor adjustments/repairs with which the pollution levels can be brought down, without affecting overall performance of the engine. What are the pollution limits? Refer to the table above to know the permitted emission limits. What if my motor vehicle exceeds the pollution limits? Incase of vehicles showing higher level of emissions than the prescribed limits under Central Motor Vehicles Rules 1989 the registration number of such vehicles should be informed to concerned RTO, Dy. RTO Or Asst. RTO by the permit holder of the testing Centre within 24 hours. What should I do with the PUC Certificate? Do I need to keep the PUC Certificate in the vehicle? Yes. You must carry a valid PUC certificate in the vehicle. (7) After the expiry of a period of one year from the date on which the motor vehicle was first registered, every such vehicle shall carry a valid ‘Pollution under control’ certificate issued by an agency authorised for this purpose by the State Government. The validity of the certificate shall be for six months and the certificate shall always be carried in the vehicle and produced on demand by the officers referred to in sub-rule (1) of rule 116.
of Sub-Inspector of Police or the Inspector of Motor Vehicles. I have heard that it is NOT mandatory to keep the PUC Certificate in the vehicle and I can produce it within 7 days from the RTO officer asking me in writing. (1) Notwithstanding anything contained in sub-rule (7) of rule 115 any officer not below the rank of Sub-Inspector of Police or the Inspector of Motor Vehicles who has reason to believe that a motor vehicle is not complying with the provisions of sub-rule (2) or sub-rule (7) of rule 115, may in writing direct the driver or any person incharge of the vehicle to submit the vehicle for conducting the test to measure the standards of emission in any one of the authorised testing stations, and produce the certificate to an authority at the address mentioned in the written direction within 7 days from the date of conducting the check. Section 116 clearly starts with the word notwithstanding. This means that even if a vehicle has a valid PUC Certificate as given in section 115, but the officer believes that the vehicle maybe a source of pollution beyond the limits, he may ask for the vehicle to be rechecked. This order to retest the vehicle for PUC norms, must be in writing and can be replied to within 7 days. It does not mean that the PUC certificate need not be carried with the vehicle or that it can be produced within 7 days. Is the PUC valid throughout India? Do I need to take a separate PUC if I am travelling to a different state in India? Yes. 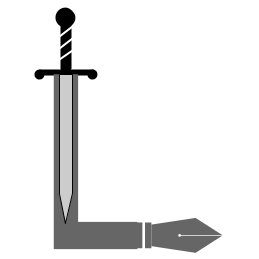 The PUC certificate is valid throughout India. (8) The certificate issued under sub-rule (7) shall, while it remains effective be valid throughout India. This entry was posted in Motor Vehicles Act, Useful Information on May 30, 2014 by admin. I have a diesel car. The PUC outlets here (Thiruvananthapuram, Kerala) takes the idle reading only. Is it legal? OR Only heavy duty diesel vehicles(trucks/lorries) require full depress of accelerator? For new Mercedes Benz do one require PUC? I have a 2 months old byke .but as per sec 155 u have no need to carry puc certificate . But police challan me for the same is it valid. Pls issue me a PUC machine for businesses purpose. Pls send me a mum. add & mob.no.thank you. As per GSR 103(E), a proviso is added after Cl. 7 of Rule 115 and it says “Provided that the validity of the certificate shall be twelve months for the vehicles manufactured as per Bharat State-IV norms.”. But as per current situation the PUC centres in Maharashtra provide PUC certificates with only 6 months even for BS-IV vehicles. Can anyone explain the logic behind providing these certificates with less validity for BS-IV vehicles? Is pollution sticker is mandatory for New Vehicles? Many police officers are giving challans to the vehicles in spite of not being old by one year. They are saying that for new vehicle, after six months only, owner should carry PUC instead of one year. During inspection taken by concerned officers how much rpm must be taken…which mean rev per minutes…is the throttle be kept in slow running or must be rev at the highest limit…. PUC is mandatory for all vehicles and industries. Justify. What is the charge of the puc certificate? Thank you for such a detailed explanation!! I have TVS 80CC vehicle, whether this vehicle needed PUC? I have Purchased New CAR on 26-03-2017 Till when i dont need to get my Car Check up for PUC.. I HAVE GREEN CARD OF ECO FRIENDLY VEHICLE RULL 115(6), IT SHOWS NON POLLUTION VEHICLE HOW MANY DAYS IT VALID ? Does Scooty, a 60cc non-geared two-wheeler, need the PUC? 1) Who is authorized to check the PUC ? 2) What should I do when the PUC checking center charge me Rs. 350/ LMV/SUV ? 3) Is the authorized polution cheking center have the wright to check vehicles at any point in any time ? 4) If my vehicle is within PUC limit is it compulsory to check for PUC ? I have BS4 bike Avenger , As per the law BS4 does not need any PUC for 1 year . What will I produce if any Traffic Police ask me for PUC certificate. The registration papers showing the registration date. i have a bs 4 engine pulsar 220, does it need a puc? Validity of PUC expired on 15/03/18 as am under medical treatment and unable to attend any PUC centre for continuation. Please guide me how can I update the PUC. The two wheeler is under KOLKATA city. Is Public Transport Vehicles exempted from the PUC law ? They are ones that cause most pollution it seems. If there is a law who is responsible to pay the fines ? What’s the km and duration of new vehicles puc is not required . I have bike bajaj dominar 400 date of purchase 8 may 2017 please suggest me for the PUC is required for my bike also . And how much validity of period for newly bike . Do PUC required for BS 4 vehicle? SIR , I HAVE BUY NEW CAR ON 13 AUGUST 2018 .. AS PER RULE PUC IS VALID FOR ONE YEAR . BUT POLICE MAN CHALLANED 1000/- INSPITE OF TALLING THE VALIDITY FOR PUC … WHAT CAN I DO..
Sir I have a PUC valid till Jul 2019 and my veh is ghaziabad registered and PUC is from Ghaziabad . The delhi police refused to accept the PUC certificate stating that the PUC of UP & Haryana is valid fro only 3 months from the date of issue in delhi and forced me to give him Rs 500 failing which he said will confiscate my car papers. I had to yield to the threat and loot as i had to travel outside the state for a family function. pl let me know the rules of PUC of other states validity in delhi so that the next time i can call the control room for help .